Editor’s Note: In 2015, the festival was canceled for the first time due to the terrorist attacks in Paris, but the city asked everyone to light candles that night. The small candle lights are flickering on every window sill. The majestuous basilic on top of the Fourvière hill, dominating the entire city, shines brightly, illuminating the whole city. 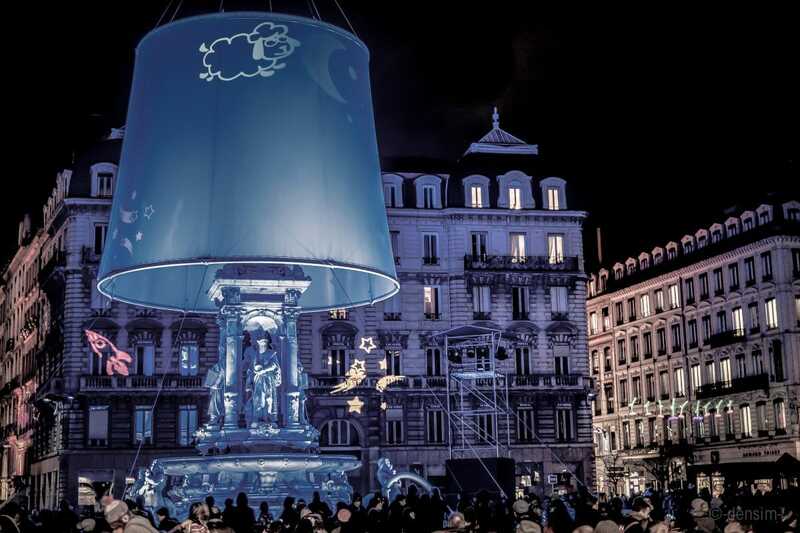 Every resident of Lyon is waiting for this magical moment all year round. 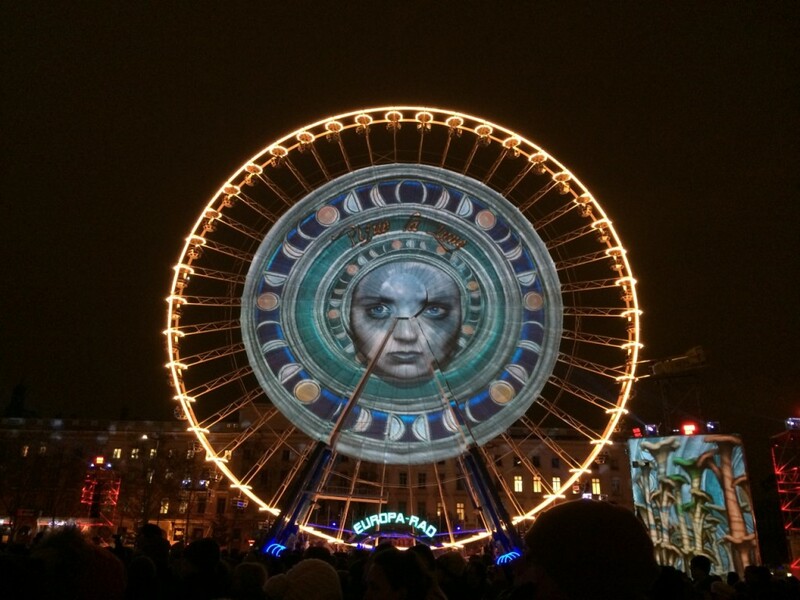 The Fête des Lumières is unique in France. What started as a religious tradition became part of the city culture. 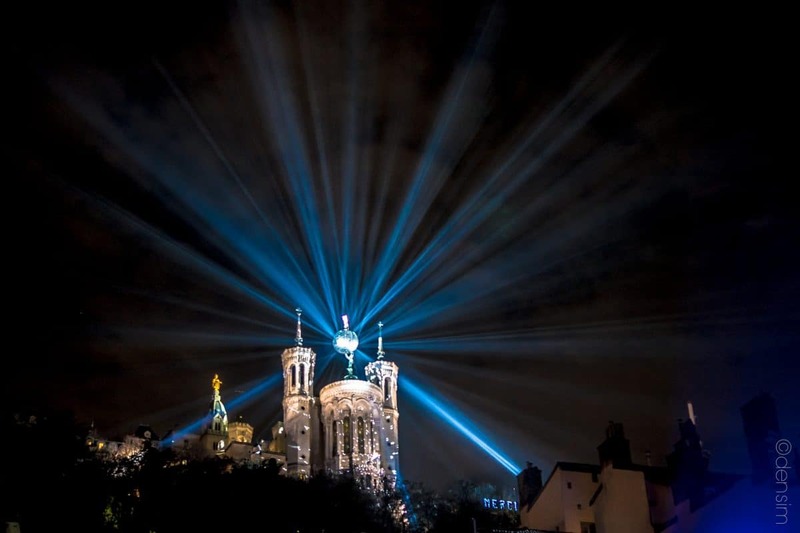 The Festival of Lights’ origins is linked to a Catholic celebration of the Virgin Mary, to whom the city of Lyon was devoted to during the Middle-Ages. On September 8th, 1643, the entire city prayed to the Virgin Mary to protect them from the coming black plague. Their wish was somehow heard and the city was preserved from the deadly disease. The population promised to repeat their grateful prayer every year from then on. In 1852, the inauguration of a statue of the Virgin Mary on Fourvière hill, scheduled for the 8th of September, was delayed by the bad weather. Rescheduled on December 8th, the rough elements threatened the celebration again but the sky suddenly cleared up. Spontaneously, the population took to the streets with illuminations of all sorts, such as candles and lanterns. That night, the festival known as the 8 Décembre was born. In 1989, the city started to highlight some of the monuments and river banks. Since 1999, the celebration lasts four days and attracts several millions of spectators onto the illuminated streets of the city. Today, the Festival of Lights is internationally known and has become more contemporary. Designers from all over the world produce the most startling installations and displays, and the vibrant light-shows, everywhere around the city, are highlighted by video, music, and sound effects. Each of the four nights of the Fête des Lumières features a different theme, changing colour schemes and creating an extraordinary atmosphere. Every day tells the spectator a different story. Every year the surprise and magic are complete. Located in the South of France, Lyon, the capital of the Rhône-Alpes region, was called Lugdunum during the Roman Empire. It was one of the major cities during that era and the Capital of Gaul. Many historical sites are still visible today and are, since 1998, listed on the World Heritage List of UNESCO. In the Renaissance, its silk industry gained Lyon an international reputation. Throughout the Fête des Lumières, Lyon becomes the theater of an amazing show that allows everyone to explore the city history and its heritage in a unique way. Seeing moving objects, 3D fantasy themes, and light effects on walls of some of the most beautiful buildings in the city is magical. Its lovely riversides and parks also take centre stage. The Rhône riverside being gradually transformed into thirty miles of waterfront attractions, with an open-air dining area, a promenade, viewing points, artworks, and nature trails. While in town, make sure to eat at a bouchon. Not the cork type but the gastronomic one! A Bouchon lyonnais is the local name for a small restaurant, where you will be sure to try pieds de cochon en gelée or pig’s feet in pig’s fat, quenelle, tripe, or boudin noir aux pommes, a sort of blood sausage served with cooked apples. The region is also internationally known for its chefs, Paul Bocuse, les Troisgros or La Mère Brazier, the first woman chef to get three Michelin stars for her two restaurants. For locals and visitors alike, this celebration of light is one of the city’s most joyful and friendly events, in an area that claims more than its fair share of amazing cultural and gastronomic experiences. It’s a long weekend packed with mystery and charm, a moment for friends, family, and strangers to come together, and all of it for free! The 8 Décembre is truly more than just another festival. It is about saying thank you, sharing a sense of belonging and unity, and expressing a message of Joy and Love. For details and practical information, check the site of Lyon’s Tourist Office. This teaser promises three nights of enchantment. 11 Responses to "Magic Takes Over Lyon During the Lights Festival"
Every year, the show is spectacular and surprising. I’ve heard so many great things about the city of Lyon, but I did not know about the light festival. I will have to plan my visit to coincide next year. I am eager to start planning this trip!! So many pretty sights and so much good food! Thank you Stephanie. I hope you can visit one day and discover by yourself everything Lyon has to offer. Yes Naomi, it is a part of every citizen of Lyon. Even when they live abroad, they perpetuate this tradition. WOW! We do a similar thing in my city, called “white night Melbourne”. This one in Lyon must be the original, and I am sure it would be such an amazing night to explore the city. Thank you Ali. It must be beautiful as well. Lyon in english by the locals.